The free-flowing football which Darragh MacAnthony is so desperate to watch was played out in front of him at Spotland today. Unfortunately for the Posh chairman, it was played by Rochdale. That’s not to say that the home side were outstanding or made you think they are certified promotion candidates (using the first match of the season to suss who will be top of the league in April is a seriously flawed exercise) but against Posh they were easy on the eye and carried a threat throughout the match. Encouraged by a perfect pitch, blue skies, little breeze and a boisterous crowd of 3,000, conditions could hardly have been more conducive to play good football, which Rochdale duly delivered. That’s not to say that Posh didn’t try to play. One move down the left involving Kgosi Ntlhe, Marcus Maddison and Conor Washington was one of the highlights of the match, even if it only led to a corner. There were other glimpses as well of a more fluid style of football compared to the turgid play which became synonymous with last season. The problem, though, was that the attacking football only came in spurts. A bigger problem was that the midfield was distinctly second best until Jack Collison came on with 15 minutes left to to make his debut. To be fair to Dave Robertson, who marked his first league match as the club’s full-time manager he at least admitted as much after the game. “I think Jack Collison was excellent when he came on. I think he touched the ball more times than the other two midfielders in the 15 minutes he was on,” he said. Jermaine Anderson was chosen ahead of Collison for the match today (Saturday, August 8) as Robertson said he wanted energy in the side. So it was no surprise that the players were told their flat first-half performance was deemed unacceptable. “We spoke to the players, we had a good conversation in the changing room at half-time and they needed to raise their game,” said Robertson. Robertson felt nerves might have played a part in his side’s lacklustre first-half. A bigger problem was putting out a defence which featured two debutants. One of them was Alex Davey who had not even trained with his team-mates before kick-off having joined the club yesterday. His arrival on a 30-day loan from Chelsea was announced shortly before kick-off with his arrival warranted by knocks to Michael Smith and Ricardo Santos, as well as illness to Shaun Brisley. He was put in alongside right-back Tobi Adebayo-Rowling, although unfortunately it turned out to be a difficult match the for the 18-year-old. For the first goal, his attempt to block a Donal McDermott through-ball only diverted the ball to Callum Camps who poked past Ben Alnwick from close range. In the second-half, Ian Henderson’s superb through-ball left him floundering and saw substitute Reuben Noble-Lazarus drill in a shot from the left-hand side of the area. 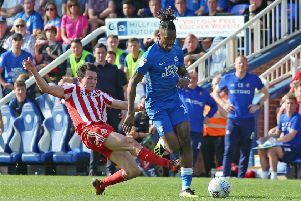 The big concern for Robertson (and MacAnthony) though, was not a difficult debut for a young full-back who is second choice in his position, but the paucity of chances for Posh to get back into the game. The best by far fell to debutant Joe Gormley, the striker signed from Cliftonville after scoring 40 goals last season. Slipped in by Maddison, he had just Josh Lillis to beat but dragged his shot from the right across goal and wide. The cry of anguish from the Posh dugout was clear. At that stage it was only 1-0 and there was still half-an-hour left in the contest. And as Robertson pointed out afterwards, Posh were on top at that stage despite the closest they had been to scoring in the half being a couple of off-target long-range strikes from Michael Bostwick, the new skipper. Gormley’s miss proved to be the beginning of the end for Posh. Noble-Lazarus scored just a few minutes later, having moments earlier seen Peter Vincenti head against the post after poor goalkeeping from Alnwick. Then Calvin Andrew, a fellow substitute, spurned two glorious chances to completely kill off the match. Twice he had just Alnwick to beat. The first time his shot was saved at close range, before Henderson’s follow-up was blocked. The second time he fired over, although the buoyant home fans did not seem to mind too much, instead chanting that Andrew would score when he wanted. Robertson threw on Collison, Harry Anderson and Souleymane Coulibaly, the latter one of five players to make his first professional appearance for the club. In the end it made no difference. Taylor saw a shot deflected wide. In the first-half he had picked out Lillis from 20 yards, while Gormley also saw a close-range flick comfortably saved. That pretty much summed-up Posh’s attacking threat during the 90 minuted. The good news for Posh fans though is that they have three home games on the trot to kickstart their season and they have defenders coming back from injury, with Santos and Smith possibly ready for action on Tuesday against Crawley in the League Cup. And one poor performance should not alter expectations for the season, especially against a Rochdale side who finished eighth last season and have kept hold of their best players. But when you have a chairman as demanding as MacAnthony, who expects goals and promotion, the standard will have to rise quickly. MacAnthony may not have taken to Twitter to voice his disapproval after today’s match but it’s unlikely he will have enjoyed what he saw. Even if amidst the his own side’s disappointing efforts, there may be a grudging respect for the style with which their opponents played. Posh: Ben Alnwick, Olutobi Adebayo-Rowling, Gabriel Zakuani, Alex Davey, Kgosi Ntlhe, Jon Taylor (sub Harry Anderson, 76 mins), Michael Bostwick, Jermaine Anderson (sub Jack Collison, 79 mins), Marcus Maddison (sub Souleymane Coulibaly, 84 mins), Joe Gormley, Conor Washington. Unused substitutes: Dion Curtis-Henry, Shaun Brisley, Harry Beautyman, Kyle Vassell. Rochdale: Josh Lillis, Andy Cannon, Oliver Lancashire, Jimmy McNulty, Tom Kennedy, Jamie Allen, Peter Vincenti, Callum Camps (sub Michael Rose, mins 79), Donal McDermott (sub Reuben Nobel-Lazarus, 67 mins), Joe Bunney (sub Calvin Andrew 63 mins), Ian Henderson. Unused substitutes: Ashley Eastham, Lewis Alessandra, Scott Tanser, Jonathan Diba Musangu.